Chatham University and the Falk School of Sustainability (FSS) are proud to announce the 2016 Eden Hall Fellows. Meredith Benek is a Master of Sustainability student from Harmony, PA with a bachelor's degree from Slippery Rock University in Environmental Studies. Meredith has had a lifelong interest in the environment and living sustainably, working as an Environmental Health and Safety Specialist. Meredith's summer 2016 internship is with Penn Forest Natural Burial Park, Pennsylvania's first exclusively environmentally friendly burial ground. She will interface with all aspects of the park - from communicating with the public, understanding the environmental impacts of the area, and situating issues within the context of a socially responsible business. Elisha (Elly) Helgen is a Master of Sustainability from Danvers, IL with a bachelor's degree from Mercyhurst University in anthropology/archaeology. After graduating, Elly spent a year with AmeriCorps and led a project that included creating a community garden within a refugee and low-income neighborhood. There she saw the many mental, physical and spiritual benefits that come from bringing communities together around a green space. During her summer 2016 immersion experience, Elly will continue working with community gardens, and further develop her skills as they relate to sustainable and equitable community development. Zachary J. Schmucker is a Master of Sustainability student from Lycippus, PA with a bachelor's degree from Davis & Elkins College in Sustainability Studies and History, where he worked to bridge the gaps between the humanities and environmental science. Zachary’s summer 2016 internship is with the United States Forest Service (USFS), where he will continue his work as a trail crew leader in the Monongahela National Forest, including trail condition assessment and remediation; land use monitoring; and community outreach. Zachary has been a crew leader with the USFS in previous years, but will expand on his role this summer by working to redevelop trails with a goal towards watershed improvement. Megan VanGorden is a Master of Arts in Food Studies student from Olivebridge, New York with a bachelor degree from Saint Michael's College in Anthropology/Sociology and Applied Linguistics. Megan spent two years with AmeriCorps, managing volunteers and working on healthy aging programs, and serving with a community food council focused on nutrition education for families with young children. Megan's summer 2016 internship involves two sites: At Eden Hall, she will create a community supported agriculture model that can be scaled up in future years to provide students with produce from Eden Hall. At Churchview Farm in Baldwin, PA, a small, woman-owned farm, she will assist with operations and the business side of running a farm that sells to restaurants and hosts a work-share program. Mollie Walter is a Master of Arts in Food Studies from Summit, NJ with a bachelor's degree from the University of Pittsburgh in Economics and History. For the last three years, Mollie has worked as a tax specialist for BNY Mellon. Currently, she interns for Three Rivers Grown, a regional food hub that specializes in distributing dairy within 100 miles of Pittsburgh. Mollie's summer 2016 internship will be with The Hatchery in Chicago, a food business incubator that accelerates economic development by helping food entrepreneurs launch their companies. There, she will use and build on her business skills, doing supply chain analysis, production and distribution, business strategy development, research, reporting on food and beverage trends, and more. 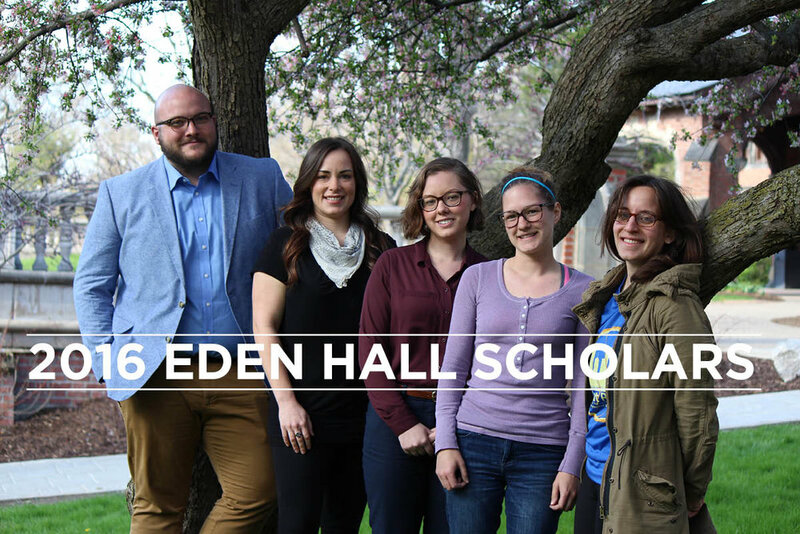 Learn more about the Eden Hall Fellows Scholarship Program, including expectations of Fellows and eligibility requirements.